This exquisite package is USA made with only the best USA made materials. Our black Soft Touch outer coating has a sleek velvet touch and plush appearance. 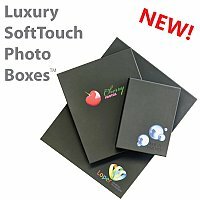 Our extra thick, heavy black cardboard inside gives this top shelf photo presentation box a sturdy, trusted photo presentation. Inside and out, this presentation is simply luxurious.